Majestic, Aquitania and other liners of the past. The latest research and information about Olympic, Titanic & Britannic and other liners, with information and news about Mark’s books and research projects. 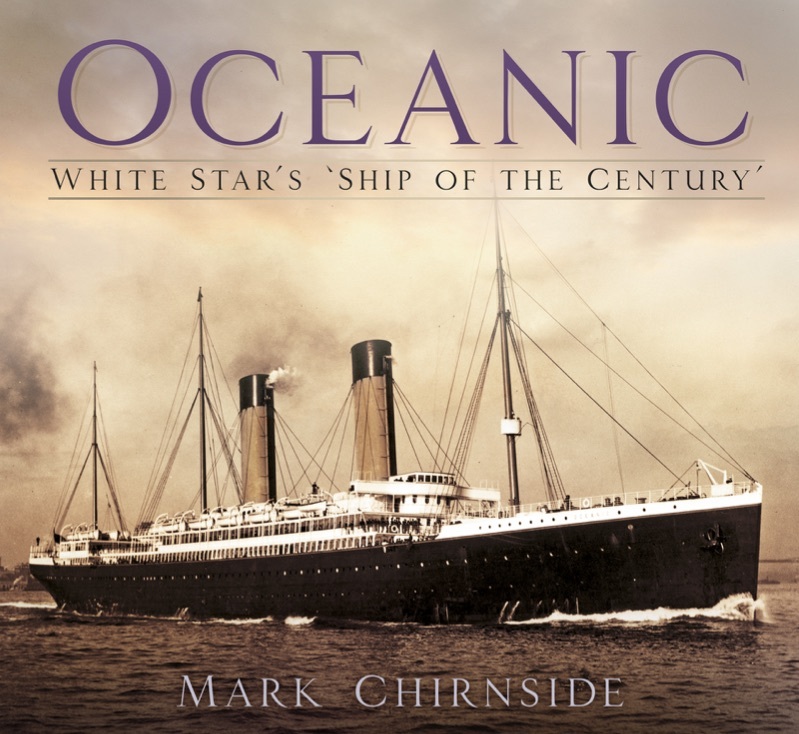 Mark Chirnside’s Oceanic: White Star's ‘Ship of the Century’ is released in November 2018. The lavishly illustrated format displays remarkable and rare images, combined with new information and original research in the first book covering her entire history from conception to the present day. Signed copies of the book can be ordered with your own specified inscription through this website. Click on the cover image below for an exclusive preview. 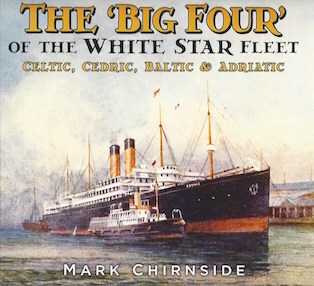 Mark Chirnside’s The ‘Big Four’ of the White Star Fleet: Celtic, Cedric, Baltic & Adriatic was released in hardback in October 2016 and softcover in May 2018. Lavishly illustrated with original research and hitherto unpublished information, signed copies are available for purchase! Site Map: if you are looking for a particular page then you may want to refer to the site map tool which lists every single page on this website. Books: Each book has its own page dedicated to it, containing illustrations and purchasing information. Reviews are included. There is also a list of books that Mark has contributed to. Articles: Material relating to a particular ship can be found by using the ship buttons at the top of the article index page, while a complete index of articles is also provided beneath them. Interviews: An index of interviews available on this website. News: Updates, news, and information about the author. An external links page is included. Hot Tip: The text on this website is set in medium size, and can be enlarged to make it even easier to read by using your browser’s View option. Mailing List: If you wish to keep abreast of updates to the website - announcements as to book releases, new articles, and other changes, then you may wish to join the mailing list. If you wish to receive an occasional notification of updates to this website, or the latest release information about one of Mark Chirnside’s upcoming books or publications, then you can join the mailing list using the form below. All contact information will be kept strictly confidential; it will never be disclosed to any third party; and you may unsubscribe at any time you choose. After subscribing, you will be sent an automated e-mail. Please check your spam folder, if you have one, to make sure that you do not miss it. It is necessary to confirm your subscription by clicking the link supplied in this automated e-mail. If you do not, then your address will not be confirmed and you will not receive any of the list messages.